There are a lot of things that can ruin your car or truck’s paint. Here are the top most common things that you can look for to help protect your paint. You probably do not think of your car’s paint as a part of your car maintenance; however, it is important part of the aesthetics of your vehicle that preserves its value. A good paint job will help you to resell your car for more money. Be very careful when you are filling up your vehicle. Try not to overfill your tank, even during Hurricane season, because the gas could run all over your car or truck. Also, make sure that all of the drips are out of the gas nozzle before removing it from your tank because you could drip on your paint job. Gas is a corrosive liquid and it will wear away at the paint job over time. At first, you might only see a discoloration on the paint job, but over time, it can become faded or even start to peel away. If you get gas on your paint, wash it away with soap and water immediately. You could even keep a cloth and some cleanser in your car for such occasions. Bugs are a problem for paint. If you take a road trip or travel around the spillway, you may return home with a blanket of bugs covering your vehicle. Bugs dry on to your paint job and can cause scratching and chipping if you are not careful. You should remove bugs as quickly as you can using a specialty cleaner designed to remove them. Never use a scouring pad or anything else to try to scrape them off — you’ll end up taking the paint with them. It is an old trick to use a coke to remove the battery acid buildup from a battery, but a coke or other drink can also damage your paint job. We’ve all put a drink on the roof of the car, and sometimes we just forget about it and drive off to a shower of coke. Drinks can dry on the paint and get sticky, eating into the paint or pulling it off in some cases. Be mindful of where you put your drinks, and wash off anything that spills immediately. Unfortunately, the bi-product of our lovely pelicans and other birds in Louisiana is that they produce a lot of poop. 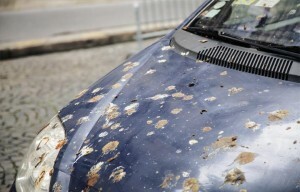 Occasionally, they dive bomb your vehicle and cover it with poop. When they do, use a specialty cleaner to get rid of it as quickly as possible. Like other corrosive substances, it will eat into your paint job if you leave it be. If you have ever been to City or Audubon Park, you have probably parked underneath one of the huge cypress or oak trees. These trees may be beautiful, but they drip sap. If you find that you have little sap dots all over your car, use a speciality cleaner to get rid of it as quickly as possible. This sap can harm your paint job. After taking care of your paint job, make sure you take care of what’s under the hood, as well. Supreme Muffler provides professional automotive services for all makes and models, including routine car maintenance up to custom fabrication work. Call us today to work with a highly trained and experienced mechanic to keep your car in top shape.